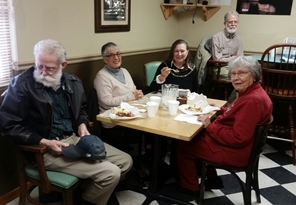 The next regular meeting of the Marshall Writers' Guild is Thursday, April 18. Dateline: 20 March 2019. The Guild presented writing awards to young writers at Bueker Middle School in Marshall. Dateline: 21 December 2018. Write On! 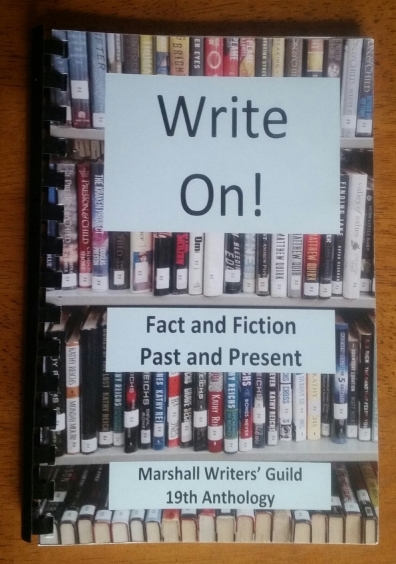 Fact and Fiction | Past and Present, the Marshall Writers' Guild 19th anthology, is on sale for $12 at the Fitzgibbon Hospital Gift Shop and Square Corner in Marshall and the Bucksnort Trading Company in Arrow Rock. The Guild is a Missouri non-profit organization. Your purchase is tax free. Guild anthologies are also sold on Amazon or EBay. with thanks to member Holly Forsman. Dateline: 21 August 2018. President Sullivan and Secretary Forsman deliver Guild material to The State Historical Society of Missouri in Columbia. 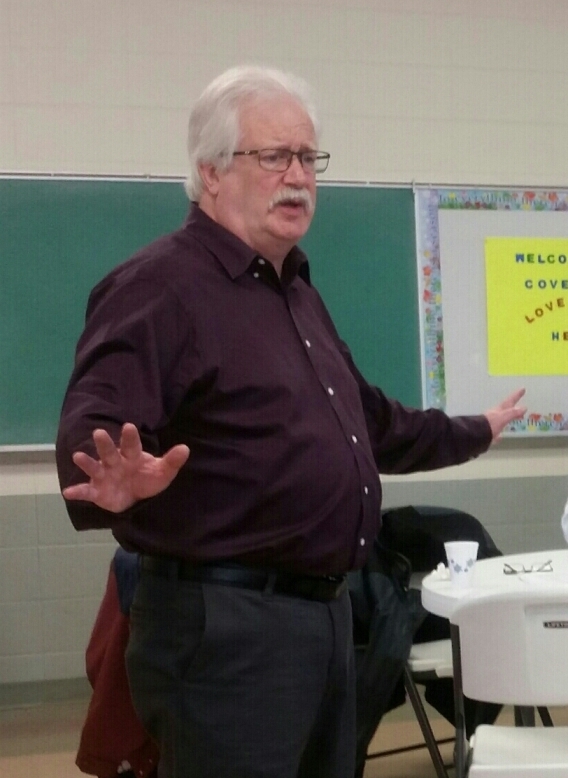 The Guilds' 2018 free community seminar on April 7 featured Vince Lutterbie who first spoke about his experiences with writing and self-publishing his successful mystery novel After the Facts. He took questions, and there was a lively discussion. 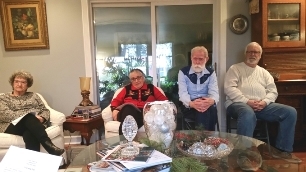 Dr. Lutterbie is Vice President of Friends of Jim the Wonder Dog, and he and Larry Arrowood, President, further described their interest in collaborating with the Guild on a book which would cover the years of Jim's lifetime (1920-35) in Saline County. with thanks to members Sharon Eiker and Holly Forsman. Dateline: 27 April 2017. This week the Guild presented writing awards to young writers in Bueker Middle School in Marshall and Slater Elementary/Middle School. 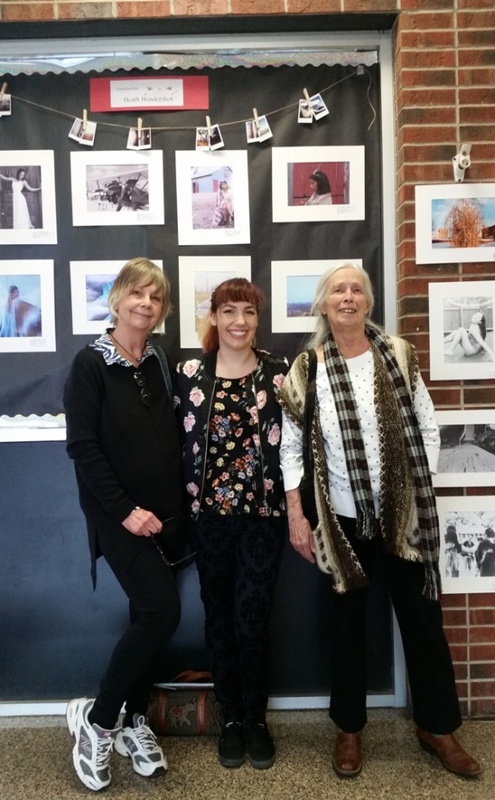 Secretary Forsman, Carly Eades, photographer and graphic designer, and President Sullivan judge Marshall High School art. What an honor! 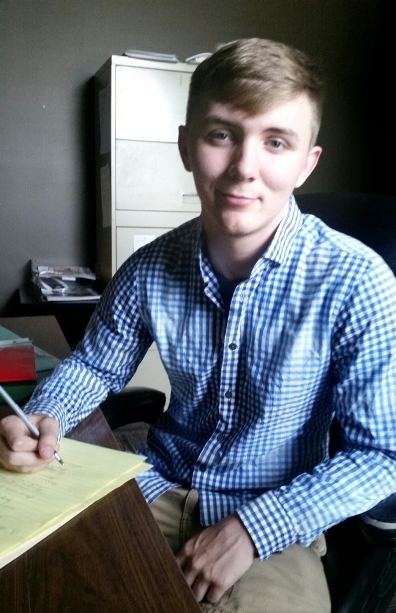 Soon this year's chosen MHS writer will be presented with the Guild's annual writing award. Celebrating another successful year at Bloomfields. Guild member and journalist Chuck Scudder will offer a two-day course on Journalism 100 to Bueker Middle School students at the Marshall Public Library on Monday, May 23, and Thursday, May 26. A Viet Nam veteran, Chuck Scudder majored in mass communications and minored in broadcast and film. He has worked for KMOS TV in Sedalia, The Marshall Democrat-News, The Abilene Reporter News in Abilene, Texas, The Kettering-Oakwood Times in Ohio, and KMMO-KMFL in Marshall. His two-day course for young writers is sponsored by the Guild and coordinated with Katie Berger, Library Media Specialist at Bueker. 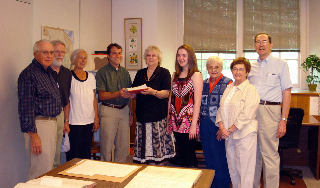 Guild writings are presented to the Missouri State Historical Society Tuesday, 27 April 2016. Dateline: 14 May 2016. 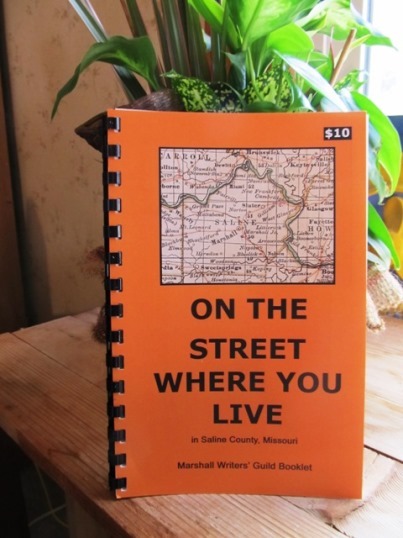 On the Street Where You Live in Saline County took first prize in the Missouri Writers' Guild Chapter Anthology Contest for 2015. The Marshall Writer's Guild booklet is on sale at the Marshall Public Library. Limited supply. 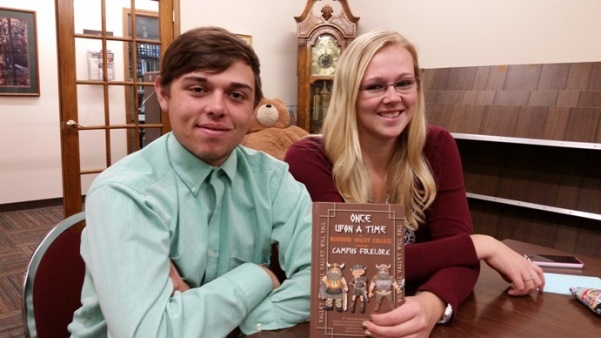 At the October meeting, the Guild was joined by Vanessa Urbschat and Rocco Scarcello, two of the authors in Once Upon a Time at Missouri Valley College: A Year of Campus Folklore, edited by Dr. Claire Schmidt, © 2015. Ms. Urbschat and Mr. Scarcello were informative and entertaining; the discussion was lively and challenging. The book is available at the Missouri Valley College bookstore. 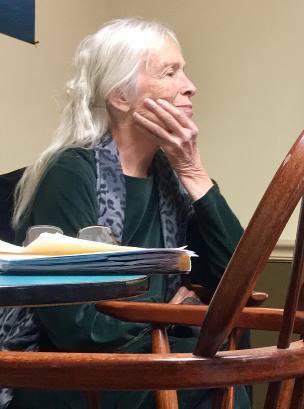 On August 20, following the meeting, a reception was held for Marshall Writers' Guild co-founder Authorene Phillips who has retired as Guild president. 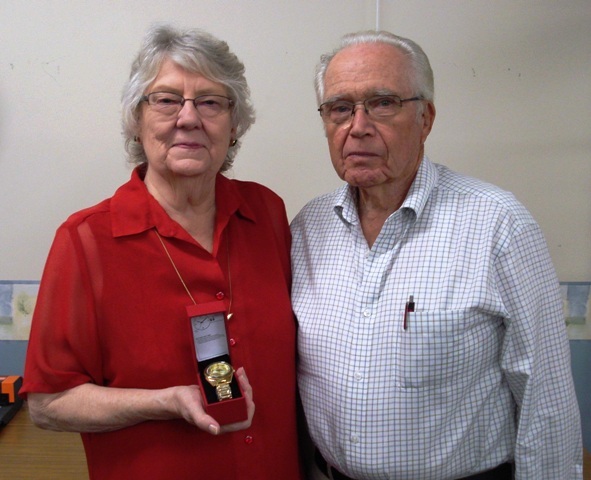 Newly elected president Dr. Edward Richards did the honors and treasurer Carole Schaefer presented Authorene with an engraved gold watch from Guild members in tribute to her 20 years of "golden leadership." The Guild will hold its next regular meeting on September 17 in the Marshall Public Library. 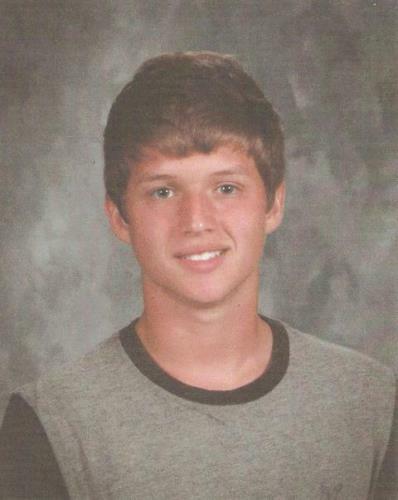 Story by Lucas Johnson in The Marshall Democrat-News, 8/21/2015. 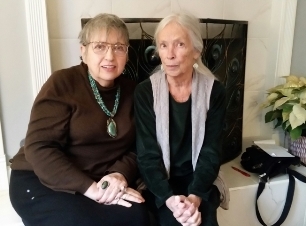 Ellen Holmes Jackson is published in "Recollections", The Marshall Democrat-News, 8/13/2015 print edition. "The R. T. Pence Farm" was first published in The Early '50s, Marshall and Elsewhere, the Guild's 2012 chapbook. 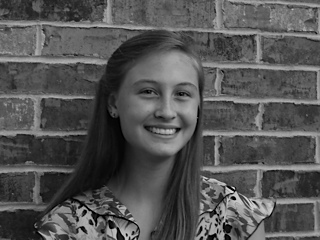 Abigail Henke, who won the Guild's young writer's grant in 2015, is the recipient of a chapter scholarship from the Marshall Chapter of the DAR. Congratulations, Abigail! 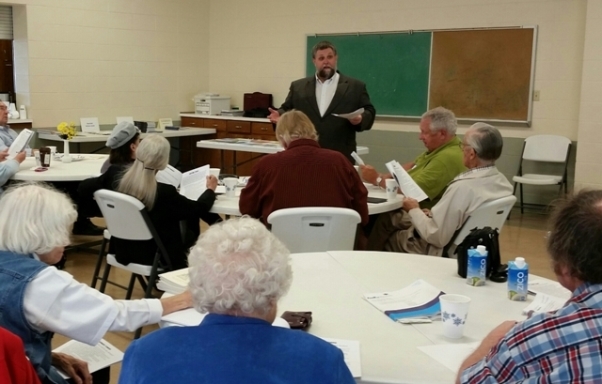 More in The Marshall Democrat-News, 7/10/2015. 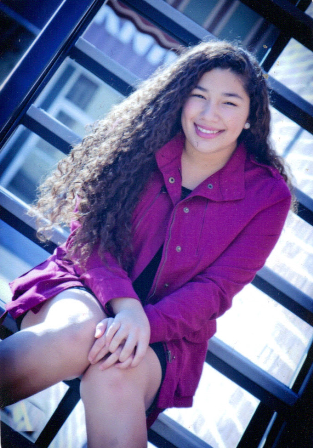 Abrea Mizer, who won the Guild's young writer's grant in 2013 and who is studying biochemistry and agricultural leadership at the University of Missouri, is the recipient of a summer internship at Montsanto. Congratulations, Abrea! More in The Marshall Democrat-News, 7/8/2015. Guild members are presently reviewing By-Laws scheduled for adoption at the July 2015 meeting. Abigail Henke, author of "To Be Incandescently Happy", wins the 2015 Marshall Writers' Guild Grant. More about the young writers' grant. 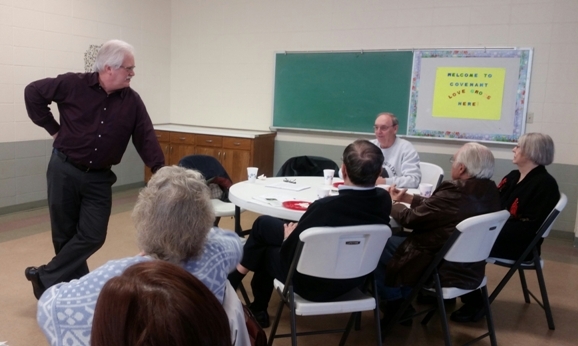 The Guild's 2015 workshop, supported by the Missouri Writers' Guild and Walmart, was held Saturday, April 25. The speaker, José Faus, is a founding member of the Latino Writers Collective and Writers Place board president. His writing has appeared in various anthologies and in the forthcoming, Working: In the Red and the Black, from Helicon Nine Press. He is the 2011 winner of Poets & Writers Maureen Egen Writers Exchange award. His presentation was exciting and engaging. He spoke of words rubbing against one another. We hope to have this speaker again. Cindy Umana, author of Blue, wins the 2014 Writers' Guild Grant. The Guild will have a table with books for sale at the Marshall Cultural Council's 4th Annual Craft & Arts Fair on Saturday, March 22, from 9 AM to 4 PM at Marshall High School. 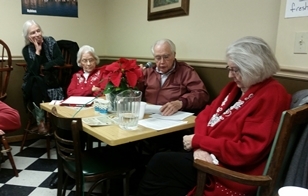 The Guild presents a skit, "Moments To Remember", to the Marshall Monday Club. 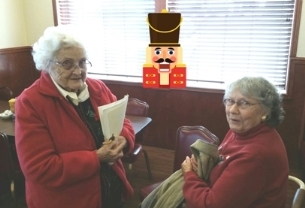 More in The Marshall Democrat-News, 2/24/2014. 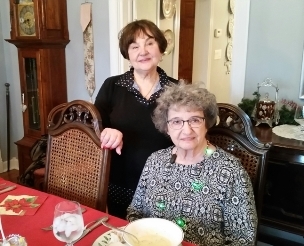 Guild member Carol Mallman Raynor is published in "Recollections", The Marshall Democrat-News, 1/29/2014 print edition. "Saturdays on the Square" was first published in Marshall Moments, the Guild's 2007 chapbook. 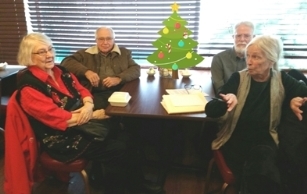 Guild member Eveleth Hill is published in "Recollections", The Marshall Democrat-News, 11/19/2013 print edition. "A Day in Marshall Remembered", her article on President John F. Kennedy's assasination was first published in Saline County Silhouettes, the Guild's 2009 chapbook. 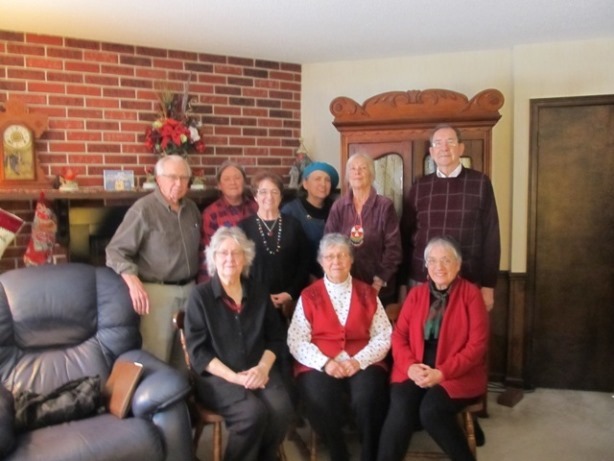 Guild member Carole Kays Schaefer is published in"Recollections", The Marshall Democrat-News, 11/19/2013 print edition. 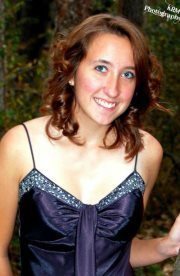 "November Sunlight", her poem on President John F. Kennedy's assasination was first published in Saline County Silhouettes, the Guild's 2009 chapbook. 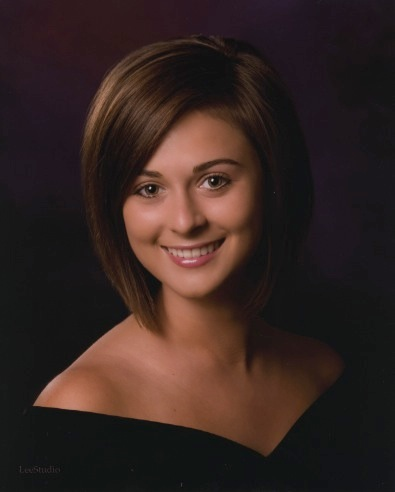 Guild member Melanie Dees Campbell is published in the Faith Column of The Marshall Democrat-News, 11/15/2013 print edition. Guild member Carole Kays Schaefer is published in "Milestones", The Marshall Democrat-News, 10/11/2013 print edition. "Mr. Marshall", her article on J. Leo Hayob was first published in Personalities, the Guild's 2006 chapbook. 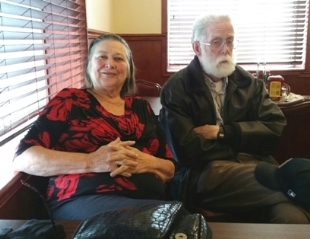 Guild member Reverend Vernon Maxted is recognized as a community contributor by the Optimist Club. 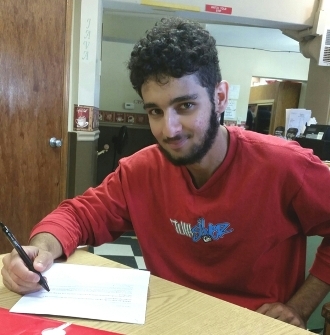 Story by Brent Kalwei, Intern for The Marshall Democrat-News, 10/1/2013. 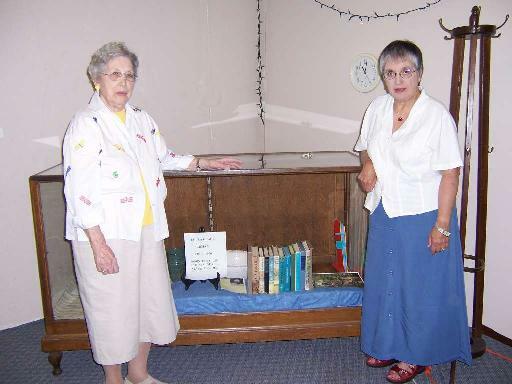 Guild member Carole Kays Schaefer is published in "Recollections", The Marshall Democrat-News, 9/26/2013 print edition. "Marshall Native Son Soared with Eagles", her article on William Forrest "Colonel" Spencer was first published in Saline County Silhouettes, the Guild's 2009 chapbook. 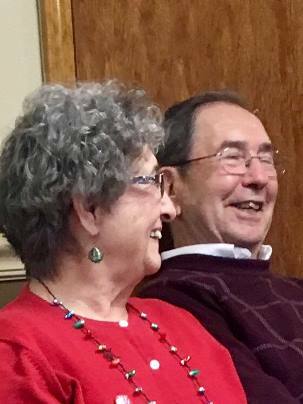 The Guild and the Marshall Public Library hosted an informal reception for author Marcia Gorrell. 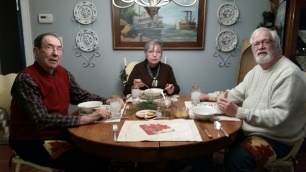 Gorrell spoke with her special brand of humor about farming, farm families and writing. Her book, Semi View, is available from The Marshall Democrat-News. Story in The Marshall Democrat-News, 9/16/2013 ~ Story by Rachel Knight, Editor for The Marshall Democrat-News, 9/20/2013. 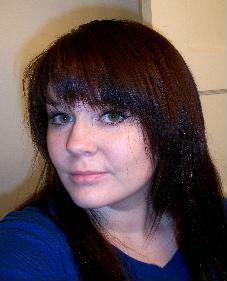 SpoFest welcomes new readers, Guild members and Night Writers Melanie Dees Campbell (more) and Jacob Hatfield (more). See The Sedalia Democrat, August 4, for article. The full article is available on line to subscribers or the newspaper is at the Marshall Public Library. The readings are on Youtube: Melanie | Jacob. Like SpoFest on Facebook. Visit Harry M. Porter celebrated by the WWII 376th Heavy Bomber Group citing Andrea Hatfield's interview of Harry Porter for The Forties, the Guild's 2011 publication. We of the Marshall Writers’ Guild wish to express our sincere thanks to you for the support you have given us the last three years with our writing projects. 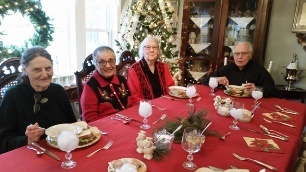 We especially want to thank Mary Mark, administrator, for welcoming us, providing those delicious lunches, and purchasing books for Westport residents. 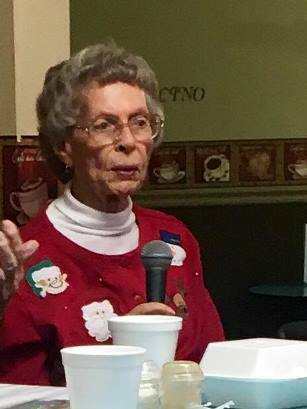 We also want to thank Shirley Kays, activity provider, for scheduling interviews with Westport residents and for sharing our stories with the residents. Last but not least, we want to thank those residents who have generously shared their irreplaceable memories with us. We feel this endeavor has been an exceedingly worthwhile project, a win/win collaboration, for all involved. So we are here today to offer you a small token of our vast appreciation. We are presenting to your library the book, The Feedsack Dress, with the hope it brings back some warm memories of a time when "make do" was the motto. 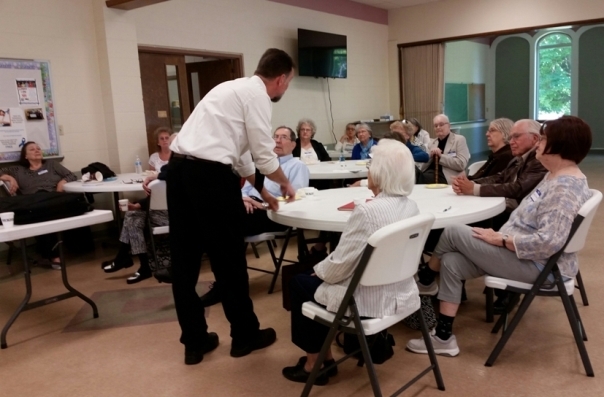 Westport Assisted Living, thank you, and God bless you all for your work here. Guild member Reverend Vernon Maxted has published The Restoration of the Church. A book signing sponsored by the Guild is planned for May 30 at 2 PM at the Marshall Public Library. Story by Eric Crump, Editor for The Marshall Democrat-News, 5/28/2013. The 2013 workshop speaker Carolyn Mulford offered sound tips and good advice on writing, marketing and publishing. Guild member Virginia Sprigg, Guest Columnist in "Recollections", The Marshall Democrat-News, 5/8/2013 print edition, interviews and writes about artist and musician Mike Henderson and his early years in Marshall. 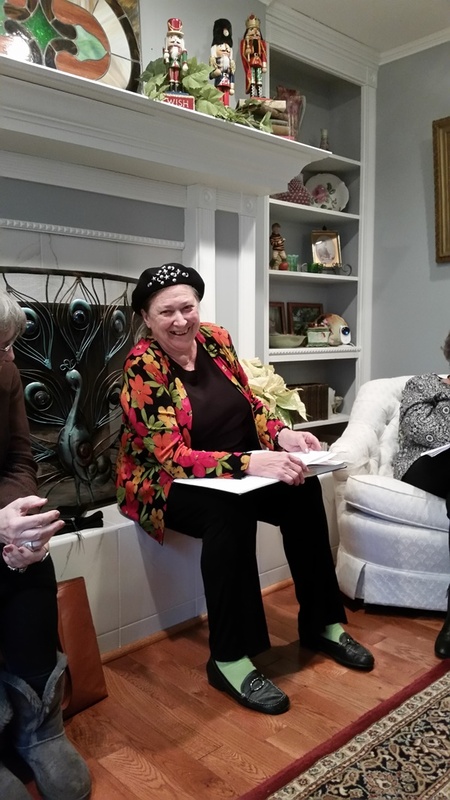 Guild member Melanie Dees Campbell portrays Harriet Beecher Stowe, author of Uncle Tom's Cabin during a meeting of Marshall's Tea at Two Book Club. Story by Eric Crump, Editor for The Marshall Democrat-News, 2/4/2013. 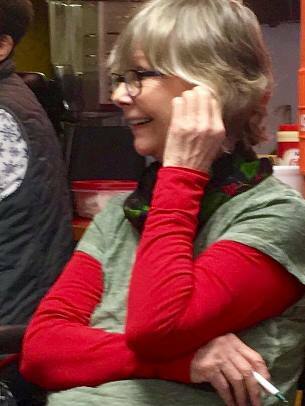 Campbell as Mrs. Charles Dickens, 1/3/2013. The Tea at Two Book Club will meet February 26 at 2 pm in the Marshall Public Library on Narrative of the Life of Frederick Douglass, an American Slave. 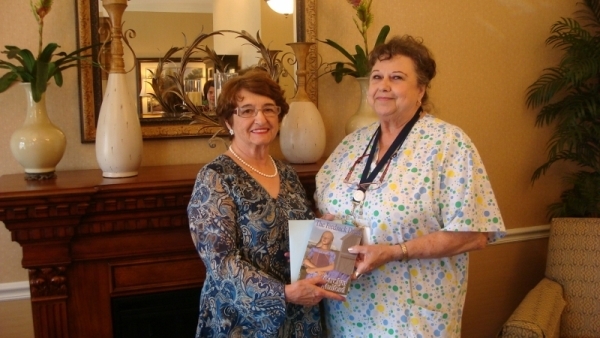 With much pleasure Guild members presented gifts of The Great Depression BitterSweet Days 1929-1939, to Westport Estates residents who'd been interviewed for the 2010 booklet. (On the interviews -- It was a great experience!! Fantastic stories!! Authorene Phillips) More from The Marshall Democrat-News, Sarah Reed, 11/9/2010. On Thursday, November 18, the Guild learned about "Just Write! 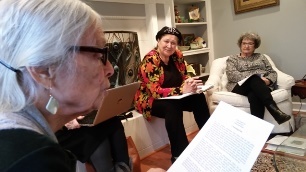 A Conference for All Writers" and the many benefits of membership in the Missouri Writers Guild from visiting MWG officers and members. More from The Marshall Democrat-News, Sarah Reed, 11/29/2010 ~ Missouri Writers' Guild. Guild member Carole Kays Schaefer's "Oh, Brother" appears in the October issue of Mature Living. On Thursday, September 16, the Guild sponsored a Self-Publishing Seminar conducted by Sylvia Forbes. The event was valuable and well attended. 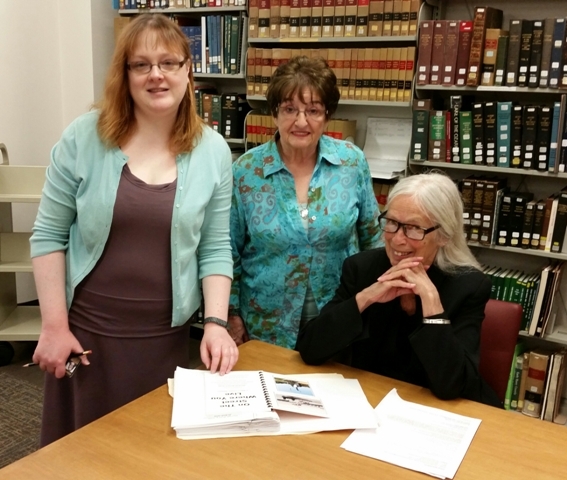 Marshall Writers Guild presented their minutes and manuscripts to directors and staff of the Western Historical Manuscript Collection-Columbia in Ellis Library on the University of Missouri campus. The group was treated to a tour of the facility and an explanation of available research possibilities. April is Poetry Month and the Guild is celebrating with the Marshall Public Library. On Tuesday, April 6 at 6 PM Night Writer Melanie Dees Campbell will MC an Open Mike for readings. All are welcome. 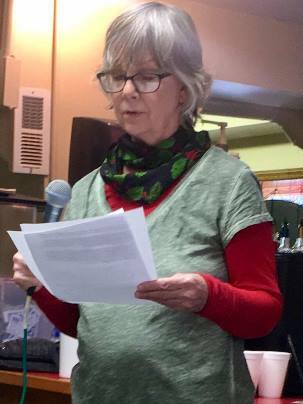 The Saturday Writers of St. Charles have announced that Carole Kay Schaefer's essay, "Hobbies I Have Known," has been accepted for publication in their literary magazine, Cuivre River Anthology Volume IV. 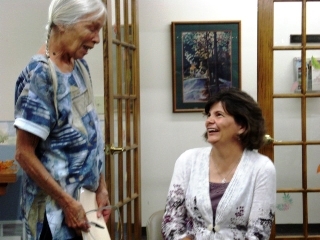 On April 17 the Guild held its annual Workshop with guest speaker and author Sharon Kinney Hanson. She was inspiring. 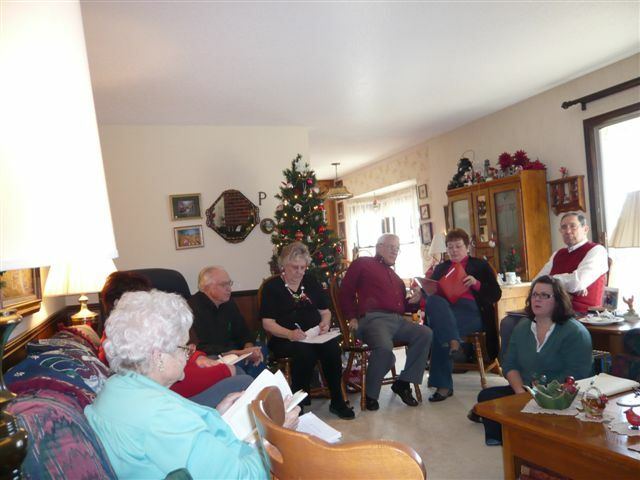 Guild members gather for a group book signing at Sedalia Book and Toy from 2 - 4 pm on Friday, November 30, 2007. 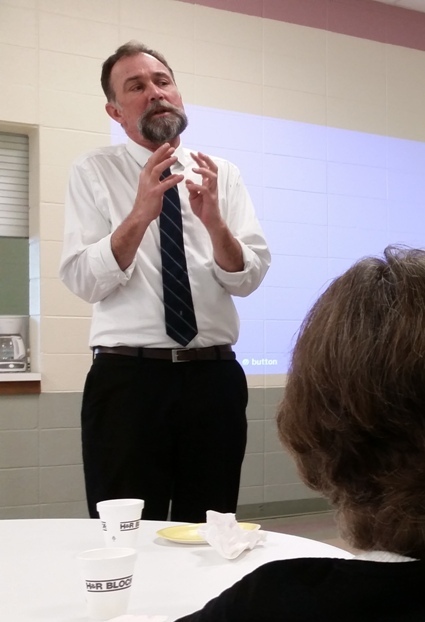 David E. Moore, Associate Director of the Western Historical Manuscript Collection-Columbia, University of Missouri, featured speaker at the October meeting. More from The Marshall Democrat-News, Kathy Fairchild, 10/23/2007. Dr. Ben Nelms featured speaker at Annual Workshop ~ Source: The Marshall Democrat-News, Kathy Fairchild, 4/24/2007. Local educator, Carole Schaefer, was surprised and honored when her teaching project was chosen to appear in the spring issue of School and Community, a Missouri State Teachers Association publication. The article highlights a writing project Schaefer developed and implemented in the classroom to improve student writing skills and help raise MAP test scores. 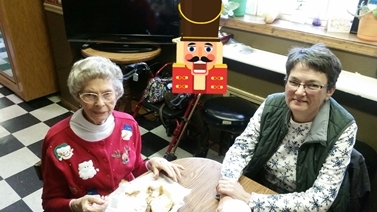 With encouragement from the local writing group, the Marshall Writers' Guild, Schaefer wrote up her project and submitted it to School and Community. New Guild member Katherine Bennett invites writers to write about a fictional character who lived in the fictional dollhouse being constructed to be auctioned for the cancer unit at Fitzgibbon Hospital. Guidelines are on the internet -- Fitzgibbon Hospital Dollhouse Project Album. 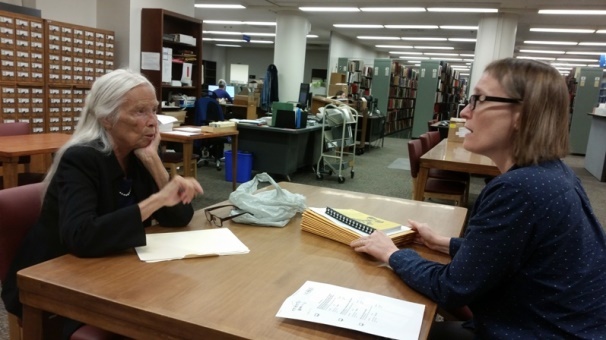 The Marshall Writers' Guild presented this collection of books by Saline County writer, Loula Grace Erdman, to the Saline County Historical Society following a program at the Marshall Public Library presented by Carol Raynor (right). 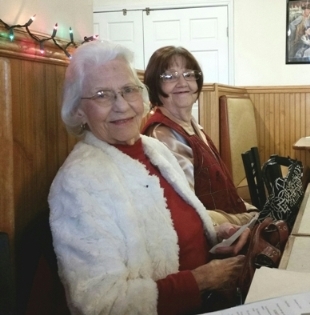 Erdman's cousin, Jean Redford, (left) added personal remembrances. Erdman's novels often featured Missouri and Missourians. She is buried in Blackburn, Missouri. The donated books are Another Spring, The Edge of Time, Far Journey, The Good Land, Life was Simpler Then, Many a Voyage, Save Weeping for the Night, The Wide Horizon, The Wind Blows Free, The Years of the Locust, A Time to Write (autobiography). 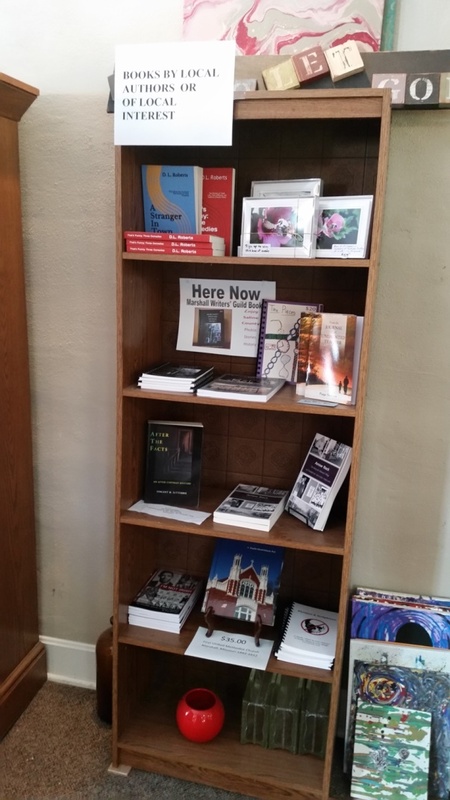 Funds for purchases were provided by a grant from the Missouri Writers' Guild and private donations.